Solanke SS*, Mahanti S**, Parulekar SV***. Arhinia is a very rare congenital malformation, occurring either alone of along with other malformations. Total arhinia is much more common than unilateral or partial arhinia. We present an unusual case of unilateral arhinia. Arhinia is an extremely rare malformation, there being only 43 cases reported in the world literature. [1-3] Though it can occur as a standalone condition, it is usually a part of a syndrome showing an absence of nasal cavities, microphthalmia, coloboma of iris, high arched palate, coloboma of olfactory bulbs or microtia. We report an unusual case of unilateral arhinia. A 21year old woman primigravida, spontaneously conceived 6 months after marriage out of a third-degree consanguineous marriage was referred to our tertiary center in view of postdatism with elevation of blood pressure to 140/90 mm of Hg. She was a housewife and husband was a laundryman. She was registered from 5th month of gestation at peripheral health center when she was started on calcium and hematinics. She had past history of tuberculous cervical lymphadenitis for which she had completed course of category I antituberculous therapy. All her routine antenatal investigations including fasting and postprandial blood sugars were within normal limits. Malformation ultrasonographic scan at 18 weeks showed a single live intrauterine gestation of 18 weeks with no gross fetal anomalies. Repeat ultrasonography at 32 weeks was also within normal limits and there was no component of IUGR or polyhydramnios detected. On arrival at our tertiary center, patient had no complaints. On examination, patient was stable with BP of 130/90 with no associated premonitory symptoms. Her uterus was full term and there was no appreciable uterine activity. Cervical internal os was closed. Her non stress test was reactive. Labor was induced in view of postdatism using Foley’s catheter for cervical ripening followed by oxytocin infusion. Eventually an emergency lower segment cesarean section was done in view of non-progress of labor with persistent fetal tachycardia. Intraoperatively, two and a half loops of umbilical cord were found around the neck. 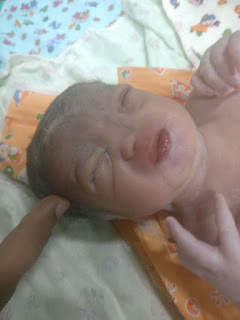 The baby cried immediately after birth with an APGAR score of 9/10 and baby weight 2404 g. Examination of the baby postnatally showed an absence of the left sided nostril, left micro-ophthalmia, left lower eyelid coloboma, bilaterally low-set ear and white anterior hairlock. There was no evidence of swelling over the nasal bridge, however hypertelorism was noted. The baby was admitted in NICU for observation and evaluation. Baby was on room air and breast feeding or expressed breast feeding. A computed tomography (CT) of the neonate showed evidence fronto-ethmoidal encephalocoele, absent left nasal cavity, failure of pneumatisation of left ethmoidal sinus, incomplete nasal septum and a defect in the midline of the bony palate. Baby however did not any features of nasal regurgitation after feeds. Echocardiography was done. It showed mild ostium secundum type atrial septal defect. It did not necessitate any active management then. Otorhinolaryngological and neurosurgical reference was taken in view of the above findings. No active surgical management was advised. The neonate was discharged on day 8 of life with an appointment for MRI brain later alongwith cranial ultrasonography and BERA to auditory assessment. Baby is now doing well at home and is to follow up in neurosurgery OPD with MRI brain to plan further management. Figure 1. Appearance of the newborn baby. Figure 2. CT scan of the head showing cleft palate (arrow). Figure 3. 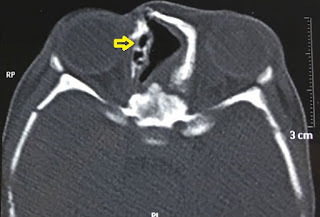 CT scan of the head showing left frontoethmoid encephalocele (arrow). Figure 4. CT scan of the head showing normal ethmoid air cells on the right side (arrow) and their absence on the left side. Arhinia was reported for the first time in 1931. It is an extremely rare malformation. The lack of an external nose is generally one part of a complex malformative syndrome characterized by the absence of nasal cavities, microphthalmia or coloboma of olfactory bulbs, high arched palate, coloboma of iris, and microtia. Bosma arhinia microphthalmia syndrome is characterized by arhinia, microphthalmia anophthalmia high-arched or cleft palate, and hypogonadotropic hypogonadism. It is believed to be due to mutations in the gene SMCHD1 conditions that are strikingly distinct from another disorder, fascioscapulohumeral muscular dystrophy 2. It can be associated with facioscapulohumeral muscular dystrophy type 2. The nose develops between the third and eighth week of life. A superior frontal process, bilateral maxillary processes in the middle, and bilateral mandibular processes caudally constitute the face at 24 days of life. The nasal placodes develop in the fifth week and form the medial and lateral nasal swellings and with the nasal pits between the swellings. The nasal septum forms by fusion of the medial swellings. The maxillary and frontal process fuse in the 6 week to form the palate. Cells in the nasal pits migrate posteriorly to form the nasal cavities. It is believed that medial failure and lateral growth of the nasal process causes arhinia. Others believe that overgrowth of the nasal medial process and its premature fusion cause this condition. Unilateral arhinia does not cause respiratory obstruction. Its prognosis depends on the presence of other anomalies. Most of the cases have normal life without any surgical treatment. Bilateral arhinia can cause severe airway obstruction at birth and an inability to feed. Such cases require surgical creation of nasal airway or a tracheostomy and placement of an orogastric tube or a gastrostomy tube for feeding. Early internal and external nasal reconstruction is important for reducing adverse psychological effects on the child. 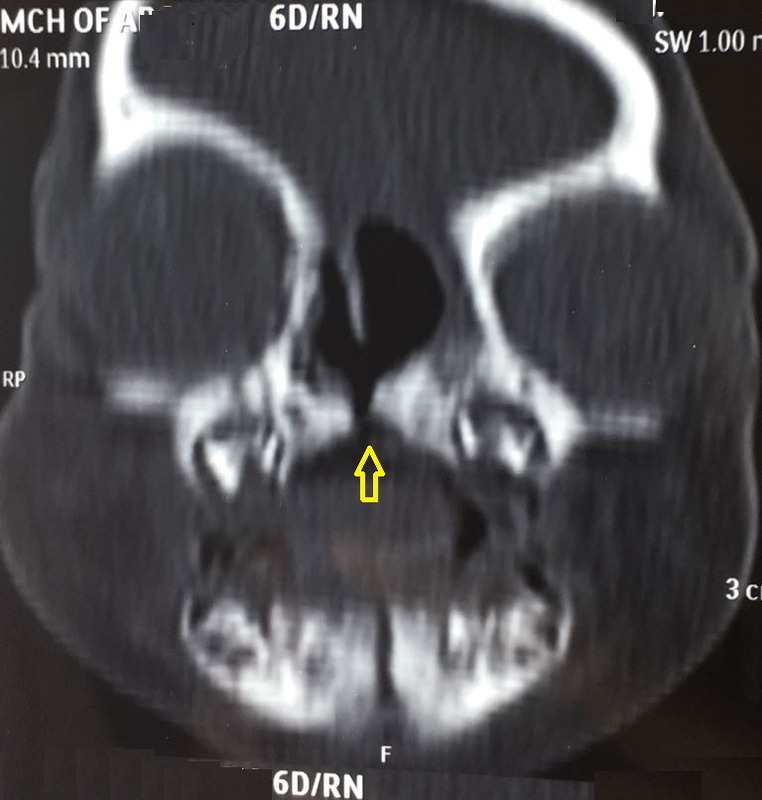 It may involve a maxillary osteotomy and a down-fracture, expansion of the forehead, elevation of the forehead flap, costochondral grafts for construction of a nasal framework and splinting of the nostrils for prolonged periods. It may be delayed until the preschool age by which time the facial development is almost completed. In our case, prenatal diagnosis was missed at another center on ultrasonography twice. Had it not been missed, adequate counseling of the parents could have been done. Fortunately the neonate did not require intensive treatment. Had she delivered at a peripheral center and the neonate had bilateral arhinia, the prognosis for the baby would been quite guarded. Consanguinity cannot be considered to be cause of the malformation in this case. Genetic studies were not possible due to financial reasons. 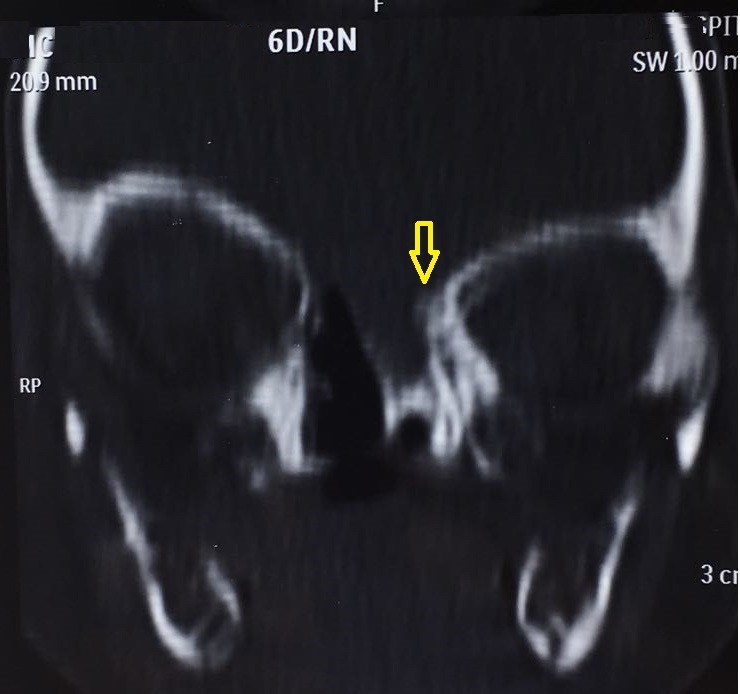 Presence of an encephalocele was an unusual feature in this case. The defect in the bony palate was not associated with any defect in the soft tissues, and hence the baby had no difficulty feeding. If the neurological status remains within normal range, the overall prognosis for the baby will remain good. A reconstructive surgery can leave the child to live an almost normal life. Blair VP, Brown JB. Nasal abnormalities, fancied and real. Surg Gynecol Obstet. 1931;(53):796–819. Olsen ØE, Gjelland K, Reigstad H, Rosendahl K. Congenital absence of the nose: a case report and literature review. Pediatr Radiol. 2001;31(4):225–32. McGlone L. Congenital arhinia. J Paediatr Child Health. 2003;39(6):474–76.] Unilateral arhinia is also reported. [Akkuzu G, Akkuzu B, Aydin E, Derbent M, Ozluoglu L. Congenital partial arhinia: a case report. J Med Case Rep. 2007;1:97. Brasseur B, Martin CM, Cayci Z, Burmeister L, Schimmenti LA. Bosma arhinia microphthalmia syndrome: Clinical report and review of the literature. Am J Med Genet A. 2016 May;170A(5):1302-7. doi: 10.1002/ajmg.a.37572. Nishimura Y. Embryological study of nasal cavity development in human embryos with reference to congenital nostril atresia. Acta Anat (Basel) 1993;147(3):140–44. Lee KJ. Embryology of clefts and pouches. In: Lee KJ, Lee KJ, editors. Essential Otolaryngology Head and Neck Surgery. Medical Examination Publishing; New York: 1991. pp. 304–6. Thornburg LL, Christensen N, Laroia N, Pressman EK. Prenatal diagnosis of total arhinia associated with normal chromosomal analysis: a case report. J Reprod Med. 2009;54(9):579–82. Hou JW. Congenital arhinia with de novo reciprocal translocation, t(3;12) (q13.2;p11.2) Am J Med Genet A. 2004;130A(2):200–3.